It was a busy week for the Copperheads playing three games in five days. What a perfect opportunity to practice a future scenario of playoffs will be like. Tuesday night the Snakes traveled to Medicine Hat to meet the Cubs. It was a sleeper first period with the Copperheads being out shot twenty-one to ten after one. With either the coaches words effective or determination of the squad seen them reversing shots during the second. After two periods the shots were thirty-three to twenty-seven for the Snakes and tied at two goals. Opening two goals came from Chase Williamson and Jeff Horvath. Third period the Copperheads stayed in control out shooting seventeen to four and winning 5-3. Key goals in the third period came both from defensemen Tyler Strath and Levi Anderson. Open net goal was off the stick of Tyler Anderson who had numerous tries through out the game in front of the Cubs tender. Broc Merkl earned the win in net stopping 29 or 32 shots from the Cubs. Friday night the Copperheads went to High River and finished strong with a victory of 14-2. At trade/signing deadline the day before the Copperheads added number 11 Taber product Linden Gouw to their roster. After his opening HJHL debut Gouw finished with a goal and two assists. The following players seen the scoresheet on the offensive side with goals plus assists ( Chase Williamson 3 G; Tyler Anderson 2 G; Jason Creighton 2 G 3 A; Riese Nevil 2 G 2 A; and Brant Mack with 2 G) Goaltender Nolan Berner was hot stopping thirty of the Flyers thirty-two shots. Saturday night was the huge match up against the second place Okotoks Bisons at the Snake Pit. The Bisons were hungry right off the start scoring nineteen seconds into the game with a boisterous celebration. The Snakes Mitchell Konschuk took the wind out of their sails scoring the next time up the ice at fifty-three second mark. From that point on it seemed the Copperheads were in control netting two more goals that period. Jedd Horvath and Ty Abbott were credited on the goals to end the first with a lead of 3-1. After the second period with a lone goal from Levi Anderson the Copperheads lead 4-1 trailing shots 25-26. Approximately mid-way in the third period Okotoks scored their second of the game. Needless to say it wasn’t quite enough as Copperheads Tyler Anderson finished it off with an open net goal. Copperheads won with a final score of 5-2 keeping them in first place of the south. Nolan Berner again was stellar for the Copperheads stopping thirty-six shots. After the weekend games, the top three current teams in the south are as follows: Copperheads 32 GM- 26 W, 4 L, 2 T for 54 pts; Okotoks 31 GM -21 W, 7 L, 3 T for 45 pts; Cochrane 30 GM- 21 W, 7 L 2 T for 44 pts. 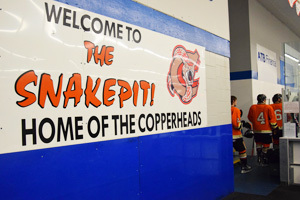 Next weekend the Copperheads will have one road game in Red Deer to face the past league champions on Saturday night. Next home game will be another affair against the Okotoks Bisons, the final time the teams meet in regular season play. Game time is 8:30 p.m. on Saturday, Jan. 26, at the Snake Pit; home advantage once again. A reminder to fans only two more home game to use those season tickets as not valid for playoffs.